We had three DeLoreans show up for the “DeLorean Oil Change Day“, and it was a great experience! 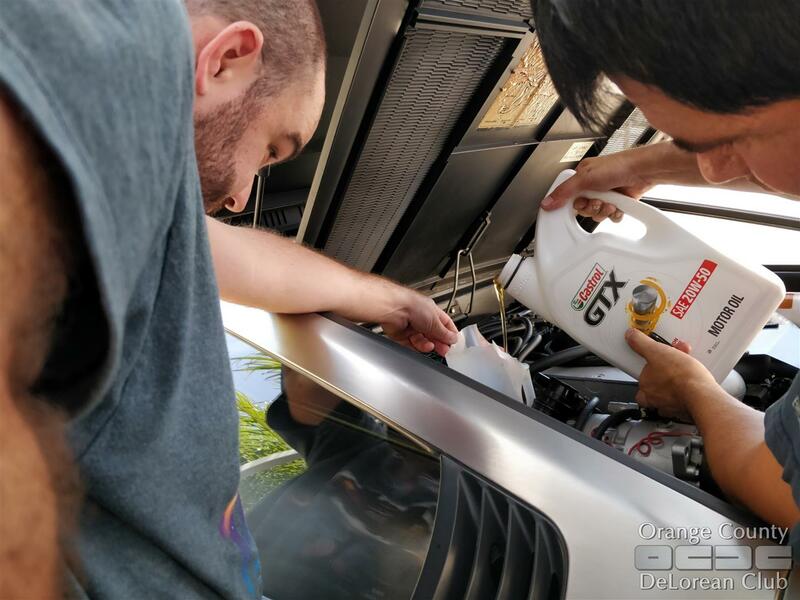 We all learned some things, we got our hands dirty, we got to connect and learn more about each other, and we got the oil changed on three DeLoreans with no issues – other than cooking in the 91 degree heat, with the sun right on us. Thankfully, with the garage and the pop-up tent, the sun didn’t cook us. We all ended up buying the same oil – the Castrol GTX 20W-50 Conventional Motor Oil, in 5 Quart jugs – and we all used the Bosch oil filter listed on the DeLorean Directory Crossover Parts page. Each 5 qt. jug of oil was about $20 including tax, and the filters were about $4 each. And since each of us used about seven of the 10 quarts, we still have some left over for the next oil change. One person successfully installed Toby Peterson’s EZ Oil Drain Valve, but there was an issue with the second car. The oil pan was a bit too low, so there wasn’t enough room to install the valve and have it work as expected. Possibly due to old/crushed/bad motor mounts, or the engine being shifted forward a tiny bit. We went back to the original plug and crush-washer. We also did some work installing one of Toby’s Wing-A-Loft systems, but not finishing it completely. That will happen soon though.